Learn about the challenge of analyzing the performance of a large scale applications with Xcode's Instruments. We'll discuss low-level details of the Time Profiler, limitations of stack-based sampling, extraction and filtering of sample data, solving for deep stacks (esp. with RxSwift), and data visualization. At Uber we used all of these techniques to reduce the startup of our main application by multiple seconds, and cut UI responsiveness latency by half. 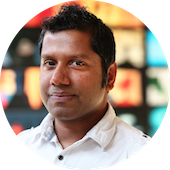 Rudro Samanta has been writing MacOS desktop apps from well before the existence of the iPhone (and attending WWDC in the days when tickets never ran out!). He has worked at Pixar Animation Studios (on desktop Mac apps for artists) and Twitter (helping build the Onboarding flow for iOS) before joining the Mobile Platfom team at Uber, where he focusses on foundational infrastructure such as app-architecture, performance, dependency-injection and more.